NICOSIA.- The Greek Cypriot community has rejected a UN plan for a Cyprus settlement in today’s referendum by 75.83 percent, which translates into 313,704 votes. A yes vote was cast by 24.17% or 99,976 Greek Cypriots. There were 480,564 registered voters, with 428,587 having voted and 10.82% abstaining. Valid votes were 96.52%, invalid 2.62% and blank 0.86%. People in the Turkish occupied areas have voted in favour of a UN plan for a Cyprus settlement in today’s referendum by 64.91%. A ”no” vote was cast by 35.09% of the voters. In the Nicosia ”district” 70.74% voted ”yes” and 29,26% voted ”no”, in the Famagusta ”district” 63,23% ”yes” and 36.77% ”no”, in the Kyrenia ”district” 63% ”yes” and 37% ”no”, in the Morphou ”district” 64.21% ”yes” and 35.79% ”no”, and in the Trikomo ”district” 55.14% voted ”yes” and 44.86% ”no”. Cypriot people rejected the plan regardless extreme pressure and threats from the US Government, EU and the United Nations. Cypriot President Tassos Papadopoulos said that the ”no” response from Saturday’s referendum in the Greek Cypriot community on a UN plan for a Cyprus settlement was not the end of the road, noting that he remained focused on reaching a bizonal, bicommunal federation settlement. In a statement at the Presidential Palace after the final results were presented to him by Chief Returning Officer Kyriacos Triantafyllides, President Papadopoulos said the people did not say ”no” to a Cyprus settlement but to the specific solution proposed. He added that when the Greek Cypriots say ”yes” to a solution, it will be a settlement in the interests of both communities on the island, and spoke about new measures to support the Turkish Cypriots. President Papadopoulos said he was satisfied that the democratic norms were observed throughout the referendum procedure. He thanked the EU, the UN and Greece for their efforts towards reaching a Cyprus settlement. President Papadopoulos said the result of the referendum in the Greek Cypriot community, which rejected a UN plan for a Cyprus settlement, should act as a catalyst for unification and not as a pretext for further division. He assured the Turkish Cypriots that he remained focused on a solution of a bizonal, bicommunal federation, noting that he would be announcing new measures to support the Turkish Cypriots and allow them, as far as possible, to participate in the benefits Cyprus’ accession to the EU. 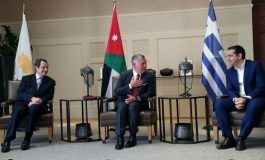 He said it was regrettable that certain persons had tried to question the will of the people, and expressed hope that the European Commission statement regarding the democratic decision of the Greek Cypriot community would put an end to the phenomenon of ”twisting the truth”. ”The people of Cyprus, with a full sense of their historical responsibility regarding their future and their duty to safeguard the implementation of a functional and viable settlement for future generations, did not accept the proposed solution plan. The will of the people should not be misinterpreted by anyone. The people did not say no to the solution. They said no to this particular plan. 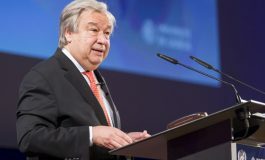 We want the reunification of Cyprus and the two communities in conditions of security, with human rights and fundamental freedoms safeguarded,” he said. ”I want to underline with emphasis that the non acceptance of the Annan plan is not the end of the road. There will be a continuation. There will necessarily be new prospects and new possibilities. 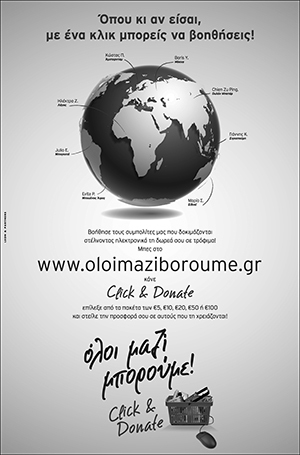 I am sorry if our no disappointed our Turkish Cypriot compatriots. They should know, however, that when we say yes it will be in their true interests. I will strive and struggle for that,” he said. ”Proof of our intentions are the new measures to support the Turkish Cypriots and, as far as possible, for them to participate in the benefits our accession to the EU offers,” he added. 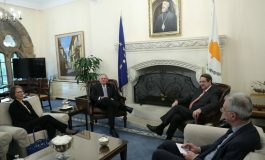 President Papadopoulos said that on May 1 the Republic of Cyprus will officially be joining the EU and expressed gratitude to the UN, the EU and Greece for their efforts towards reaching a Cyprus settlement. ”Our accession opens new horizons and new prospects. We will utilise them constructively to achieve a solution, which Greek Cypriots and Turkish Cypriots will be able to embrace warmly, because it will guarantee everyone’s rights and will seal their common future permanently,” he added. ”Greek Cypriots and Turkish Cypriots deserve a better fate. A secure future for ourselves and the generations to come. I will struggle for this. I am sure we will achieve it,” he concluded.